Travel Disruption: Heathrow disruptions today and advice on flight delays and cancellations. If you’re experiencing Heathrow delays or your flight is impacted by severe weather or industrial action, there’s a few things you’ll need to know. Can you claim compensation for your delays? Use our Claims Calculator. Find out if you can claim for flight delays due to bad weather, like snow to fog, or from industrial action; as well as how much compensation you may be entitled to by using our Claims Calculator. Jump to see our advice on what to do and how to repond to your flight delay and what your passenger rights are. Get to know when Heathrow airport, or your airline, is required to help you out – whether it be food or accomodation. Find out why your flight isn’t leaving at the scheduled departure time. We look into how the weather effects flights, from Heathrow delays due to snow, fog or generally bad weather and why your flight is delayed. Alternatively, check your flight info with our Online Flight Departures Board or browse the Heathrow Disruptions today. Take a look at our top tips on staying up-to-date with what’s going on with the Heathrow airport weather disruption. 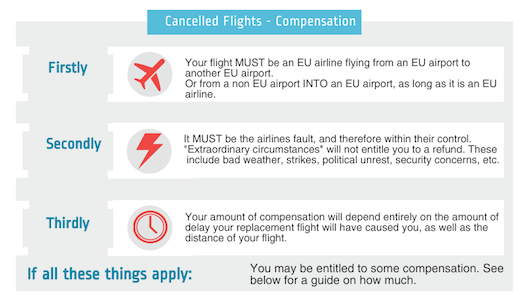 Use our Claims Calculator to find out what you could be entitled to in compensation from your airline. Bare in mind, any flights delayed for less than 3 hours are unlikely to provide any compensation and you’ll have to contact your travel insurance provider or the airline seperately to make a claim. Here’s our guide to understanding your compensation results. You’re not always guaruanteed a pay-out if your flight is delayed, there’s a number of factors that can cause airlines and airports to delay your flight. Essentially, it depends how long you’ve been delayed for and why you were delayed. Whether it’s strike action, bad weather such as snow and fog, or traffic control issues, different causes, mean different compensation brackets for you as the passenger. How can I get compensation from my travel insurance provider? All travel insurance policies are different and offer different levels of cover. It is best you contact your insurance provider or read the policy wording document on their website to find out how much compensation you are entitled to if your flights are cancelled or delayed. The airline has a legal obligation to provide you with a flight to your destination as your ticket is a contract with them, despite any Heathrow disruptions today or tomorrow. If there are no later flights available you should ask the airline to book you a flight from another airport and pay for your transport to that airport. If this is not an option then you should consider alternative modes of transport and apply to have your ticket refunded. There’s three options if you’re trying to get around Europe without flying. For example, if you’re eager to get away, you could hire a car and drive to your destination. Some car hire providers will let you drive your hired vehicle across Europe and drop it off in your destination country. Bare in mind, companies can sometimes charge extra for letting you take the car across country borders and charge you for crossing back again. Other choices are public transport links. Another mode of transport would be to take the ferry if you are trying to get to Europe or, if you’re trying to get to France or Belgium, you could try and take the Eurostar. The Eurostar is a train which travels from London St Pancras train station to Paris and Brussels. However, just because London Heathrow isn’t flying, doesn’t mean the rest of the UK isn’t. So if you’re going further afield than Europe, say you’re flying to Bali or New York, local ferries and the Eurostar won’t really help you. Therefore, if you are travelling internationally and you cannot get a flight with your airline from Heathrow airport you should try and get a flight from any airport within the UK. If there is no alternative available, your airline should provide you with a refund for your disrupted flight within seven days. Where possible, call them ahead of time or check their website or social media for updates. Check your booking confirmation to double check which airline you are flying with and give them a call for the latest update or what the next steps are. It is best to check flight details with your airline as soon as possible; if your flight is cancelled you may be advised not to travel to the airport. Keep checking for up to date information about the airport by checking their Twitter or by calling your airline directly. You can also check major flight disruptions on the BBC website. If your airline cancels your flight the airline must give you the option of rebooking an alternative flight; either as soon as possible, or at a later date. If no flight is suitable you can request a refund. If the flight is cancelled due to reasons out of the airline’s control they will not pay for cancellation of your accommodation or cancellation of any other arrangements. However, if you have taken out a comprehensive travel insurance policy when you booked your holiday, any Heathrow delays should be covered and you should be able to claim back most of the expenses incurred from cancelling the holiday from your travel insurance provider. Please check with your insurers to see if they can help. Try to stay calm – you’re in safe hands, the airlines know what they are doing and if your flight has been delayed or cancelled it is for your own safety! There’s nothing to be achieved by getting angry at any airline representative. As they say, don’t shoot the messenger. If your re-booked flight leaves 2 hours after the scheduled flight your airline should provide you with free meals while you wait and accommodation if needed, as well as two free phone calls. 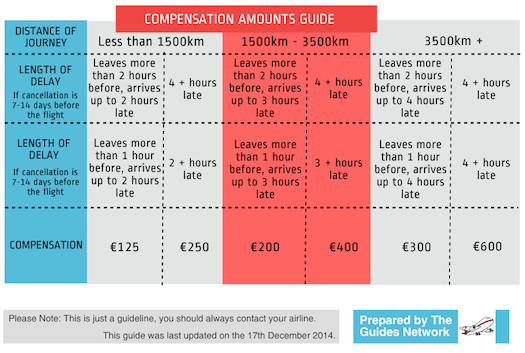 The level of compensation will depend on the distance you are travelling and how much later you will arrive from the original flight. To find out what the Heathrow Airport weather warnings are today, and what they mean for your flight, we recommend finding your flight details with our online Flight Departures Board. Often Heathrow will warn of destination closures, so if you’re flying to Bali where there’s a volcanic ash cloud, your flights will be cancelled. Alternatively, weather warnings will be in relation to the UK, such as Storm Doris in Feburary 2017. Our online departures board will give you the most accurate times for your flights and any Heathrow disruptions today. As for why your specific flight is delayed, stay up to date on your airlines’ social media, website or with local news. Likely causes for Heathrow delays are weather disruptions, technical issues or strike action; but really Heathrow Airport weather warnings could come down to a whole array of causes, both in the UK and at your destination. The weather might not be suitable for flying, see how each weather type affects flying below for snow, rain, wind and fog. Alternatively, if you’re recieving news that your flight is delayed for other reasons, it’s possible there are strikes, a technical error or in exceptional circumstances, the airline may no longer be flying. Why does snow disrupt flights? One of the most common causes for Heathrow delays, is when it’s snowing is that every plane must be completely de-iced before it can take off. This is because any ice on the plane affects the wings and fuselage which makes the planes more difficult to control. 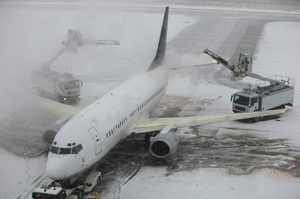 In severely cold temperatures, planes must take off as soon as they are de-iced to prevent the ice building up again. Therefore, this causes delays as de-icing cannot be done in advance at the start of the day. Another major cause of Heathrow Airport weather warnings and subsequent delays, are when the runways and roads are covered in precipitation or ice. Heathrow has to be cleared of any snow and ice to get as many flights out as soon as possible which is usually the airport’s responsibility, i.e. Heathrow’s disruption team. If too much heavy snow has settled on Heathrow runways, then the airport may have to be closed while the airport is cleared of all snow. Planes cannot take off when there is any snow on the ground. Larger airports like Heathrow and Gatwick are more impacted by severe weather than smaller airports as they have so many flights that a delay of a few hours causes a huge backlog of flights. On the other hand, they often have bigger and more efficient teams to deal with Heathrow delays and flight disruptions because they are bigger and dealing with more traffic. The issue being if there are multiple delays at Heathrow due to weather disruptions, planes will have to wait their turn to use the runways and begin your holiday. Just because disruption teams are fast, doesn’t mean the whole process is going to be an instant fix. Often if Heathrow Airport gives a weather warning, officials may decide it’s not worth clearing all terminal runways of snow, if snow is forecast to continue falling over a long period of time. Alternatively, it’s not the UK weather at all and the airport weather warnings are coming from your destination country. While we have a very changable weather system in the UK, more extreme weathers can be found internationally. For example, some airports may announce weather warnings because of volcanic ash, meaning you can’t fly from Heathrow because you cannot land on the other side, Bali and Iceland frequently experience this. Other examples include hurricanes around Florida and neigbouring southern states of America which cause delays from Heathrow. More weather warnings: Why does wind, rain and fog disrupt flights and cause delays at Heathrow? When it comes to flying a plane, pilots and flight crews aren’t just looking with their eyes. Pilots have systems to tell them their altitude, radar, temperature gauge and wind speeds – even being in constant contact with the Air Traffic Control team back at Heathrow to let them know exactly what’s going on in the skies. So why does rain and fog cause so many airport weather warnings and have that much of a difference to Heathrow delays? To begin with, the flight crew themselves have to get to the airport, just the same as you and all of their passengers. This means driving through fog and coping with the various accidents on public transport and the roads en route to work. 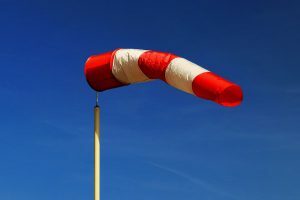 Wind probably causes the most hassle with take off, landing or if you’re travelling in higher altitudes (for flights from Heathrow to America, for example). This is when you experience turbulance and the seat belt sign will come back on mid-flight. There’ll be a limit to how hard the plane’s engines can work to maintain the same speed on a good day as they do when travelling against the wind or jet stream and whether it’s safe to fly at all. Despite all the specialist equiptment on board a plane, it’s still pretty useful to see clearly with your own eyes. Flight crews will be more confident and probably more efficient when travelling on a clear day than when there’s weather disruptions. While they may rely on Air Traffic Control and their plane’s systems, you’re more likely to experience less Heathrow disruptions and have a cleaner and fast flight on a nice day. At the end of the day, if it’s not safe to fly, you won’t be flying. Heathrow flight delays are there to keep you safe. Why do strikes result in Heathrow delays? Striking action can also lead to disruptions which although are usually localised to certain organisations and locations, these can still affect your journey. I need to get to the airport but there are major transport disruptions before I get there! The key to avoiding these problems however lays simply in planning your journey effectively. 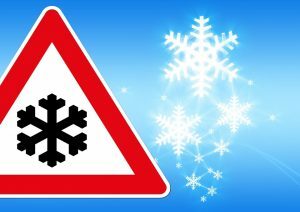 Leave plenty of time to get to the airport, especially if you know there’s snow or strikes forecast or check scheduled times the night before on things like Travel and Road Report sites, National Rail and Trainline. Keep plenty of distance between you and the car in front in case they break suddenly or you hydrplane. Drive slowly to ensure they’re always completely in control of their vehicle. If you start to slide on ice, steer into the direction you’re going to regain control. Keeping yourself informed about any Heathrow disruptions and delays will play a major part in streamlining your journey. Utilise news websites, travel apps, twitter and radio so you’re up-to-date with the latest news regarding your method of transportation which should help you avoid any problematic routes. There can sometimes be cases where it just wont be possible for you to make your flight, for example weather disruptions are so severe that it is unsafe for you to travel. In such circumstances where no one is really at fault you should check your flight’s status and speak to your airline as it’s more than likely to be affected if the weather conditions are that bad, or alternatively look to your travel insurance for compensation.